3 bedroom listed property in a fabulous location below Stirling Castle with unrivalled views of the King's Knot and countryside beyond. 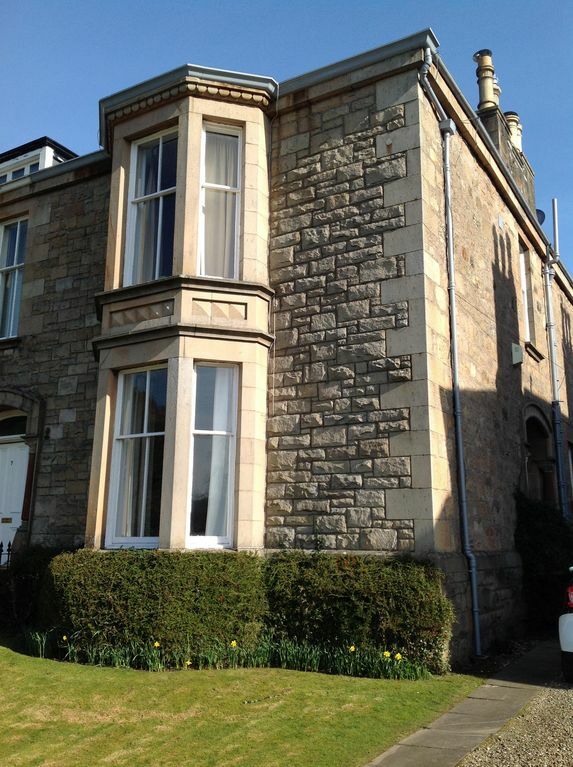 The house is also close to the amenities of Stirling City Centre and within walking distance of the train station. In addition it is an easy drive from Glasgow or Edinburgh airports. Perfect for enjoying the beauty of Scotland as well as the culture of two big cities and the compact nature of Stirling itself. The property has recently undergone a period of refurbishment including a brand new bathroom and further exciting improvements are planned. Because it was my parents' house it feels like a home from home although I have done quite a few improvements since they lived there! The location which is second to none. Just below Stirling Castle with magnificent views in the distance yet so close to all the amenities of town. toilet, tub, Ground floor bathroom has shower handset and is compact. My family had an amazing stay in Royal Gardens, with open views over King's Knot and up to Stirling Castle. It is an easy walk into town with a good selection of restaurants and good road and rail transport connections. Best of all, we went to see Runrig on their farewell tour; and got an extra night of music with fireworks. You could not have chosen a better spot for your concert. I am glad you liked the house too. My family of six was very comfortable in Alison's home. It had plenty of comfy blankets, pillows, towels, etc. The kitchen was well stocked. The view was lovely and the location is excellent for going to highland games, Edinburgh, St. Andrews, Loch Lomond, and of course hanging around the beautiful town of Stirling. We did not meet Alison in person, but all communications were quickly answered. The weather could have been a bit sunnier for us, but I guess that is Scotland! Thanks so much for your lovely comments. I am sorry the weather was not the best but as you say that’s Scotland! Great, very spacious house in a lovely area. View from bedroom window is a delight. Comfy bed, well stocked kitchen and enclosed, private garden. Would recommend! I am delighted that you enjoyed your stay and Thank you for your kind comments. Really enjoyed staying there. It's a beautiful house in a beautiful area close to town and the train station. Would highly recommend. Thank you, Kamile, for your lovely comments. We love the house and are glad you did too. Die Ferienwohnung ist im typisch englischen Stil eingerichtet und liebevoll dekoriert. Mit 5 Personen unterschiedlichen Alters ist genügend Platz. Es gibt viele elektrische Küchengeräte (Mixer, Küchenmaschine, Elektrogrill, Toaster,Wasserkocher, Tassimo-Maschine, Schnellkochtopf, Fleischgartopf, elektisches Küchenmesser...). Die Lage am Royal Garden mit Aussicht auf die Highlands ist ideal für Spaziergänge in Stirling und als Startpunkt für Trips in die nähere und weitere Umgebung. Nach Edinburgh oder zum Loch Lomond sind es nicht mal 1 Stunde, nach Braemar in die Highlands nur 2 Stunden. Sehr schönes großes, gepflegtes Haus mit allem, was man braucht. Große Zimmer, gut ausgestattete Küche und komfortables Badezimmer. Die Lage ist super, unterhalb von Stirling Castle, man ist über den back Walk in 5 min am Schloss. Aber auch die Innenstadt ist zu Fuß gut erreichen. Herrlicher Blick. Kleiner Hinweis für Kaffeetrinker: es ist keine "normale" Filter-Kaffeemaschine vorhanden, sondern ein Tassimo Automat. Ich bin sehr froh, das es dir gefallen hat.